Ultima Quest System is a universal system that allows to create quests and dialogues easily. 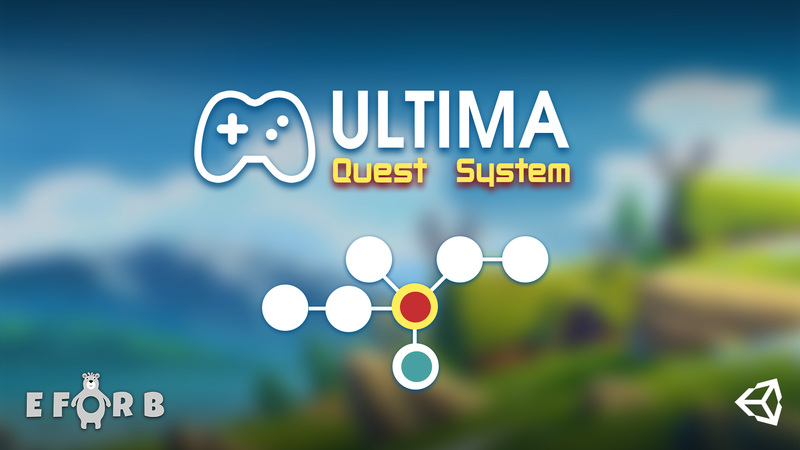 Ultima Quest System is based on a node system and is very easy to use. Flexible architecture allows to create a huge variety of all sorts of conditions, dialogues and triggers. Minimal use of the code, all work is in a convenient visual editor. Embody the fantasy in a convenient and easy UI. Quest journal and event system will provide convenient functionality for setting of any quest logic, as well as saving and loading them. Includes a full-fledged dialog editor that allows to create simple, complex and condition-dependent dialogs. Detailed documentation with visual images. Several variants of the most common mechanics in the examples. feedback as soon as possible. Eforb is the game developing company capable to make as many free games for you site as you need. From the moment of foundation and up to the current moment the company has created numerous successful projects that have brought a significant increase of income for the clients. How to Create A Gaming Website? If you want to create a real game arena on your website make sure you are ready to run a website with numerous games. You also need to be ready to launch a support team and updates for the website on the permanent basis. If you are interested in the best and fastest way on how to make a gaming website there is a good news for you as Eforb company can make such a website come true in several weeks. How to Promote Website for Free Online Games? If you want your project to remain live it is necessary to make sure the site for free games is being properly promoted. Without promotion you won’t get traffic, without traffic you won’t get rewards for placing ads and without rewards there won’t be any income and you will have to close the project. So in order to promote the website you can use our SEO services - we can both provide you with the outstanding reputation and the first places in the Google search query. Do You Need to Add Games to Your Website? You really need to add new games if you are running such a website especially if there are flash games for your website as those are the most popular when it comes to online browser gaming. If you do not manage to do this the flow of new users and retain rate of the existent users will decrease dramatically. Once you are interested in how to make a gaming website for free there is going to be a bad answer you won’t probably like. It is almost impossible as you definitely need both games and website to be developed otherwise you won’t be able to launch the service. What Games to Add to Your Website? Both strategies are good enough to get adhered - for the first strategy you will get a huge competition, but also the traffic is going to be significant if you manage to win that. For the second strategy the competitions is rather low, the loyalty of clients is high and any kind of indie game can once become a bestseller so that it will boost your website popularity. How to Add Games to Your Website? If you want to add games to your website make sure you have ordered a proper admin panel from the service manufacturer. Here in Eforb we can offer you outstanding design services so that adding games for your site would be as easy and comfortable as possible. How to Put Games on Your Website on Your Own? If you want to know how to add games to your website on your own you should understand that there are many flash software manufacturers that offer their products for a lease, so you can contact those instead of purchasing games (if you have no valuable ideas on the story or gameplay). Types of Free Games for My Website? When you have decided to put games on your website make sure those fit your service style and will call a reaction (positive reaction would be better) from your target audience. There are many examples of game arenas that were shut down because the owner of resource did not manage to provide a proper assortment of software. How to Put Flash Games to Your Website? You need to contact a manufacturer of such a game like Microgaming company and this would be a good answer on a question how to add free flash games for my website. Just make sure you have a license for the software placed otherwise you may be sanctioned or your resource could be banned from Google. We also can produce free flash games for website so contact us if you need really popular viral attractors to catch attention of your clients. How to Put Embed Games to Your Website? This can be done just like for the flash ones - it is rather easy and doesn’t demand any special skills or big money. So if you have understood how to add games to website it doesn’t really matter what kind of software to add. These are almost forgotten although still gather loyal audience if manufactured properly. You need a separate section for these as flash games usually look much more better and are more popular among the mass audience.